"I'm always interested in the mechanisms of things," she says. "And when I heard that I had a disease, I kind of felt naturally that that would have a biological basis, and I figured that I could study that biological basis and understand it and then maybe fix it." 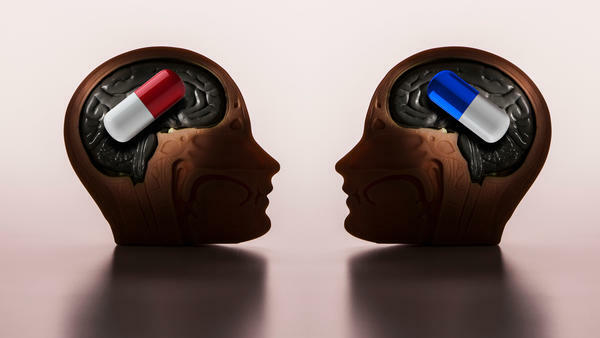 Now it has been 30 years without using drugs or alcohol for Grisel, a professor of psychology at Bucknell University, where she studies how addictive drugs work on the brain. Her new book is Never Enough: The Neuroscience and Experience of Addiction. The changes in behavior that happen during adolescence are so important and lasting because the brain is forming permanent structures. So whatever you experience as an adolescent is going to have a much more impactful influence on the rest of your life trajectory than it would, say, if you did this at another time in development when your brain wasn't so prone to changing. Probably [the brain is] not mature until about 25, and this is a really critical time. We see definitely lasting changes on the brain and behavior. So binge drinking certainly predisposes toward alcoholism. It also alters the circuits, the connections, between nerve cells and the pathways, including the dopamine pathway. It's not just drinking early or how much you drink, but the pattern that you drink — and binge drinking is probably the worst pattern if you want to predispose toward problem use. Alcohol is such a mess. It's a tiny, tiny molecule, and it acts all over the brain in so many different pathways. It affects endorphins, as I said, and dopamine. It affects glutamate and GABA, the two primary excitatory and inhibitory neurotransmitters. It affects all kinds of ion channels. It's so small that it can act all over the place. And so it's been really hard to study. In fact, we still are just beginning to understand how it is that you feel drunk — what the mechanisms are for feeling drunk — because it acts kind of like a sledgehammer or just in a widespread way to disrupt all kinds of cell functioning. Cocaine is the perfect opposite of alcohol in this way. It does one thing. It does it really effectively. It blocks the recycling of dopamine and other neurotransmitters like ... norepinephrine, and that enhances pleasure and enhances arousal and enhances movement. So it's very specific. It's easy to study, relatively, I should say, and much easier to understand how it works. What's unfortunate is the brain does adapt to that, and it adapts by decreasing the number of sites that THC can have an effect [on]. So those sites down-regulate, meaning they go away over time, and it doesn't take long, but ... the more you use and the more often you use, the less of those receptors there will be. ... When you take away the drug, then things seem sort of lifeless and gray and maybe less interesting. Opiates make a user feel like they are not suffering, that they are completely content, completely comfortable, completely well, that everything is OK the way it is. And I think that for that reason they're so attractive, because often we don't experience that things are OK the way they are. So they are kind of a perfect antidote to suffering of any kind. The problem is [that] if we reduce suffering and we produce euphoria using opiates, the brain adapts. And so now we don't feel high and completely content with them; we just feel not sick and miserable. And when we take them away, we feel full of suffering — much more suffering than we had started with to begin with. So the brain produces its own type of suffering. Methadone is a pure substitute addiction, so it takes the place of other opiates. It's easier for society because it's very long-lasting, so people aren't going through this really intense period of withdrawal. ... It's cheap and it lasts a long time, and it makes the user not withdraw. So for the rest of us, it's kind of a nice thing because these people who are opiate dependent are kind of out of the way; they're not so hard to deal with. But for those users — especially if they're young — it's even harder to get off of methadone than it is to get off of, say, heroin, because it lasts such a long time. I do think we really, as a society, cannot get enough. It's everywhere. I also think, though, that it's important to ask individually, I guess, "Is this drug use enhancing my life, or is it diminishing it?" So for coffee I can say, happily, it's enhancing my life and the costs of a little tolerance and dependence are not so bad, because I can just drink three cups. But I think that is something that we have to go into our own hearts to know the answer to. Sam Briger and Thea Chaloner produced and edited the audio of this interview. Bridget Bentz, Molly Seavy-Nesper and Scott Hensley adapted it for the Web. This is FRESH AIR. I'm Terry Gross. My guest, Judith Grisel, is a neuroscientist who studies how addictive drugs work on the brain and why they're so hard to give up, whether they're illicit drugs, like heroin and cocaine, or prescription drugs, like opiates and certain anti-anxiety and insomnia medications. Grisel is also a recovering addict, 30 years sober, who started drinking when she was 13 and later added marijuana and cocaine. Is marijuana addictive? That's something we'll talk about later. Grisel has written a new book, called, "Never Enough: The Neuroscience And Experience Of Addiction." She's a professor of psychology at Bucknell University. Her recent research has been investigating how men and women respond differently to alcohol. Judith Grisel, welcome to FRESH AIR. So you write that you decided to study the neurological basis of addiction because you started to think that your addiction might have a neurological base, that maybe there was a way of explaining it and, therefore, a way of fixing it. What made you aware that there might be a biological model, a neurological model, and what initially seemed to fit with your experience? JUDITH GRISEL: I think I'm always interested in the mechanisms of things. I think that was something that was in me as a child. My mother says I spent the first 10 years of my life turning over rocks. So I think it's just something about me that is inclined to look at explanations in terms of mechanism. And when I heard that I had a disease, I kind of felt, naturally, that that would have a biological basis. And I figured that I could study that biological basis and understand it and then maybe fix it. GROSS: So when you started learning about the neurochemistry of addiction, did you have any moments where you thought, yes, that's how I felt? Yes, that explains me? GRISEL: One after another. So that was really enlightening for me. There is a common substrate for all addictions in the neurochemistry and dopamine pathways, and it made perfect sense to me that my dopamine pathways were especially tuned to hear signals from drugs and other things. GROSS: You started drinking when you were 13, which is pretty young. Why is it especially bad to start drinking and using drugs when you're still an adolescent? GRISEL: Yes. It really - we're seeing more and more how this period in adolescence, when people are figuring out who they are, what they care about, what they like, what they dislike, who they want to be with, what they want to study, all those things are that way at this time because their brain is so plastic. And what I mean by plastic is it's undergoing unbelievable amounts of remodeling. So the changes in behavior that happen during adolescence are so important and lasting because the brain is forming permanent structures. So whatever you experience as an adolescent is going to have a much more impactful influence on the rest of your life trajectory than it would, say, if you did this at another time in development when your brain wasn't so prone to changing. GROSS: So since your brain is very plastic and still modeling when you're an adolescent, if you start using alcohol or any drug when you're, say, 13, like you did, does it change the way your brain matures? GRISEL: Yeah. So when the circuits are being laid down, if they're laid down under the influence of a drug then they're going to be laid down differently than if it's not under the influence of a drug. If you start using at 28 when the circuits are already more or less set then you're not going to have such a long-lasting impact. GROSS: Are you more likely to become addicted if you start using alcohol or any kind of addictive substance and you're an adolescent? GRISEL: Absolutely, for exactly this reason. So 80 percent, at least, of people who have a substance use disorder started before they were 18. GROSS: You also write, pertaining to yourself, that you were almost never sick or hung over from drinking. Did that have to do with your age, too? GRISEL: Probably partly. So my liver was young and fresh. I think that helped. But also people like me who are prone to alcoholism, for instance, are known to be those who can take their drinking pretty well. So if you take a big drink sometime early on and you get really wildly sick and can't control yourself, you're less likely to then drink again. So for me and others like me, it's mostly good and not bad really early on. GROSS: A lot of college students are into binge drinking. So figure 18 to 22 years old. Is the brain still, you know, more plastic, or has it matured by then? GRISEL: No. We see that probably it's not mature until about 25. And this is a really critical time. We see, definitely, lasting changes on the brain and behavior. So binge drinking certainly predisposes toward alcoholism, and it also alters the circuits, the connections, between nerve cells and the pathways, including the dopamine pathway. So yes. It's not just drinking early or how much you drink, but the pattern that you drink. And binge drinking is probably the worst pattern if you want to predispose toward problem use. GROSS: Do women metabolize alcohol differently than men? GRISEL: They do. They - the same amount of alcohol has a bigger impact on women, a higher risk for physical or for addictive problems. And that is because they metabolize it less well than men. So the same amount of alcohol has a bigger impact on a woman's body and brain than on a man's. GRISEL: There are a couple reasons. One is that women have more body fat. So there's not as much blood supplying fat as it's supplying muscle. So the same-weighted women - let's say 130-pound woman and 130-pound man. The man will have more blood, and so the alcohol is more diluted in the man than in the woman. So it's higher concentration in the female. But also, she transports alcohol out of her stomach faster. It's metabolized more slowly. So there's higher concentrations for those two reasons. GROSS: I feel sometimes like there must be a lot of pressure on women to drink, young women, to drink as much as the men. And if they metabolize - if the women metabolize alcohol differently, it means they're going to be more drunk and more prone, maybe, to addiction and maybe more prone to being taken advantage of. GRISEL: Absolutely. So they - I think, especially on college campuses, this is a very big issue. And binge drinking is increasing more in women than in men. So not only do I think they feel the social pressure to drink, but I also think there's mounting evidence that young women and older women are drinking more to cope with stress and anxiety than men. So the reasons for drinking and the consequences of drinking seem to be depending on the sexes. And I think for women, even though there's less use disorders overall - and that's kind of been a longstanding pattern - that gap is narrowing. And women don't need to drink as much to have as bad of a effect. So it sort of progresses more quickly to problems. GROSS: When you started drinking when you were 13, what need do you feel like alcohol was serving in your life? GRISEL: Yeah. It's funny how I didn't recognize the need until I had a drink. So for me, I had had little sips here and there at family parties and things. But the first time I got as much as I wanted was when I was 13, and I drank probably a little more than a half a gallon of wine, splitting this with a friend in her parents' basement. And I suddenly felt less anxious, less insecure, less inept to cope with the world. I felt like there was this - suddenly, I was full and OK in a way that I had never been. GROSS: And do you think that has to do with the way you're wired? GRISEL: I guess it must. I mean, it was so complete and so profound. I really remember thinking, like, ah-ha, I can get through my life now. I didn't even know - I was probably not the most happy-go-lucky kid. But I was sort of getting through OK. But once I found that ticket - and it felt like a ticket to me - I suddenly realized, wow, this is how people survive the pains of living. So I think that's what the neurochemistry underlies that is, is something that I've been pursuing for 30 years since then. But I think there are probably lots of explanations. I think that one of them might involve endorphins. So I study this as a topic of research, and it's not - you know, it's one of thousands of ways to get at this problem. But it looks like people who are prone to alcoholism - because they have alcoholics in their family or they're somehow genetically at risk - have lower levels of endorphin. And we know endorphin as a kind of a natural morphine-like compound. And so morphine or endorphins make us feel at peace, and restful, and not suffering and sort of at ease. And so I think I may have a deficiency of endorphin. And because alcohol is a terrific stimulator of endorphin synthesis and release, it's likely that when I drank all that wine, I suddenly was flooded with endorphins, and that's partly why I felt so great. GROSS: Let me reintroduce you here. If you're just joining us, my guest is Judith Grisel. She's the author of the new book "Never Enough: The Neuroscience And Experience Of Addiction." She's a recovering addict and a neuroscientist. She became a neuroscientist to study the neuroscience of addiction. She's also a professor at Bucknell University. We'll be back after a short break. This is FRESH AIR. GROSS: This is FRESH AIR. And if you're just joining us, my guest is Judith Grisel. She's the author of the new book "Never Enough: The Neuroscience And Experience Of Addiction." And that title refers to two things in her life. She's a neuroscientist who studies the science of addiction, and she's also a recovering addict. She's been sober for 30 years. People take drugs because they think it make - the drugs make them feel good. But as you point out, if you're taking an addictive drug, after a while, the drugs just kind of make you feel normal. They don't get you high anymore. But if you stop using the drug, you feel sick. You feel - you're in pain. You feel really terrible. So there's a neurological explanation for that. And you say that has to do with the fact that the brain is always trying to bring you into a state of homeostasis, into a state of stability. So the brain compensates for things that are unusual that are going on. So how does that figure into addiction? GRISEL: Yeah. The brain compensates for regular unusual things, you could say. So the more you take a drug to change the way you feel, the more your brain produces the exact opposite state. And it does that so that you're at this stable, homeostatic baseline. And you can tell if something important is happening. So I drink coffee every morning. I wouldn't think of not drinking it. And when I wake up, I don't really wake up. I'm - I am - drag myself out of bed, straight to the coffee pot. GROSS: You'll produce that when you don't have the drug. GRISEL: Right. Yeah. And so - or even as you take the drug so that it doesn't really work so well. So that makes you tolerant to the drug. So someone who's a naive user will get a big experience of the drug. But a regular user just feels about normal. GROSS: And does that figure into why it's so hard to give up the drug? GRISEL: Absolutely, because without the drug, then you feel less than normal. You have this adapted brain state that will only feel normal when the drug is delivered. So your craving is focused specifically on getting back to the normal state. So the - it's really - you know, what once was a luxury or felt especially wonderful now just makes you feel OK. GROSS: Now, does that explain, for instance, if you take a drug to help you sleep because you have trouble sleeping, when you stop taking the drug, your insomnia is way worse than it was before you'd started taking it? GRISEL: Absolutely, exactly that. Yes. And so many people take drugs to help them sleep not realizing that those drugs are making them not able to sleep in the long run. So you have to have the drug. GROSS: In writing about different drugs, you say alcohol is like a pharmacological sledgehammer. Cocaine is like a laser. Marijuana is like a bucket of paint - red paint. So in order to understand what you're getting at, let's start with alcohol. Why is it a pharmacological sledgehammer? GRISEL: Yes. Alcohol is such a mess. It's a tiny, tiny molecule. And it acts all over the brain in so many different pathways. It affects endorphins, as I said - and dopamine. It affects glutamate and GABA, the two primary excitatory and inhibitory neurotransmitters. It affects all kinds of ion channels. It's so small that it can act all over the place. And so it's been really hard to study. In fact, we still are just beginning to understand how it is that you feel drunk, what the mechanisms are for feeling drunk, because it acts kind of like a sledgehammer - just widespread - in a widespread way to disrupt all kinds of cell functioning. GROSS: So all of your perception is altered. GRISEL: All of your perception, all of your thoughts, all of your experiences. And, of course, it's dose-dependent. GROSS: OK. So if alcohol is like a pharmacological sledgehammer, you say coke - cocaine - is like a laser. GRISEL: Yeah. Cocaine's the perfect opposite of alcohol in this way. It does one thing. It does it really effectively. It blocks the recycling of dopamine and other neurotransmitters like it - norepinephrine - and that enhances pleasure and enhances arousal and enhances movement. So it's very specific. It's easy to study - relatively, I should say - and much easier to understand how it works. GROSS: So you're saying that it doesn't affect, like, walking a straight line or driving a car. GRISEL: Well, no, it doesn't. You could walk a straight line and drive a car probably better in some ways, you know, depending on how many - how - what your dose is and if you have paranoia or something. It's not all wonderful. But it's - because its actions in the brain are so specific, it's easier to understand how those actions connect to the experiences we have. So it produces this strong sense of pleasure and euphoria because it lets there be more dopamine transmission in that pathway we talked about, the news (ph) pathway. It produces more behavioral movement because it produce - it leads to more dopamine in the movement pathway. So it's pretty clear to study and specific in its actions. GROSS: You say - OK, to recap, if alcohol is like a pharmacological sledgehammer and coke is like a laser, marijuana is like a bucket of red paint. GROSS: That sounds like a contradiction. GRISEL: Well, it does one thing, but it does it everywhere. So for cocaine, it does one thing but it does it in just a few pathways. Alcohol does many things all over the place. THC, the active ingredient in marijuana, does one thing more or less but everywhere. And that thing is to enhance communication between cells, to enhance the message - so to kind of turn up the gain or the volume on a particular message that neurons are communicating. GROSS: So explain that a little bit more in terms of the effects of marijuana. GRISEL: So when we smoke marijuana, the whole brain is flooded with THC, and that causes the cell-to-cell - to communication in cells throughout the brain to be enhanced or to be exaggerated. And that's really fun because it seems like, wow, everything is so interesting. Everything is beautiful. The music is so rich. The colors are so wonderful. The food is delicious. Everything at once is turned on. That's not how the natural system would work. It would work sort of with discretion. But anyway - so all over the brain, it's enhanced. And that makes everything seem richer and more interesting. What's unfortunate is the brain does adapt to that, and it adapts by decreasing the number of sites that THC can have an effect. So those sites downregulate, meaning they go away over time. And it doesn't take long, but regular use - the more you use and the more often you use, the less of those receptors there will be or those sites for THC to act there will be. And that means that when you have THC, things aren't quite that great. They used to be wonderful, and now they're just pretty good. But when you take away the drug, then things seem sort of lifeless and gray and maybe less interesting. GROSS: Oh, are you describing a form of addiction? GRISEL: I think so. So there is addiction to THC, and we know that it stimulates dopamine in the - in that pleasure or news pathway. And that's really the definition of whether or not a drug is addictive. It does so more in some people than in others, but of course, those are the ones that are at risk for addiction. It also causes tolerance, like I'm describing. So if you smoke regularly, then there are fewer sites for the THC to act. And therefore, you need more to try to produce the same effect, which eventually, you won't be able to do. So you're dependent, also, because when you take the drug away, things are not as good as normal. GROSS: My guest is Judith Grisel, a neuroscientist and author of the new book "Never Enough: The Neuroscience And Experience Of Addiction." After we take a short break, we'll talk about drugs that are now being used to treat opioid addiction. And rock critic Ken Tucker will review new albums by guitarists Steve Gunn and Michael Chapman. I'm Terry Gross, and this is FRESH AIR. GROSS: This is FRESH AIR. I'm Terry Gross. Let's get back to my interview with Judith Grisel, a neuroscientist who studies how addictive drugs work on the brain and why they're so hard to give up. She's the author of the new book "Never Enough: The Neuroscience And Experience Of Addiction." She's a recovering addict who's been sober 30 years. Dealing with her addiction is what made her decide to become a neuroscientist and understand how the brain processes addictive drugs. When we left off, we were talking about how marijuana may be more addictive than a lot of users think. Just as many states are starting to legalize marijuana, neuroscientists are stepping up and saying, hold on. Marijuana might be more addictive than we thought. And I think you'd probably say that's especially true for adolescents and young adults. GRISEL: Yes, I would definitely say the risks are greater for young people, which is the people, by the way, who are biologically and socially and culturally prone to try new things. So it's a little bit of a - you know, a double bind because they're likely to try it, and it's likely to have this long-lasting impact. But I think whether or not it should be legalized is maybe partly a question of whether or not it's harmful. I think neuroscientists do think, largely, that it is harmful, can be harmful. It can change the course of brain development and have long-lasting effects on brain pathways having to do with mood and cognition and susceptibility to addiction. But so can alcohol, and alcohol is very legal and widely accepted. So I think a counterargument is that, well, if we were worried about the safety of a drug, in terms of whether or not it should be legal, then marijuana and alcohol are at least on par - if alcohol isn't maybe worse. So I'm sort of agnostic on the question of whether or not it should be legal or shouldn't be legal. I'm really for informed choices though. I think if people better understand what the drug is doing to their brain and how it's doing it and when it's doing it, maybe they would make choices in their better interest. GROSS: Do you think some people are more inclined, for instance, with marijuana to become more dependent on it than other people would? GRISEL: I absolutely think that. It's funny I was talking to kind of a stranger who read a piece I wrote the other day. And he said that he had always struggled with anxiety and irritability and that when he smoked he was less anxious and less irritable. So I think there is good evidence that people who use drugs excessively and who really like them from the start are self-medicating a kind of neural deficiency or a deficit. And in this case, THC really works to alleviate his anxiety and, as he said, to make him kind of a better person. And he knows that he's addicted to it. He knows that he doesn't really get high. He doesn't really enjoy it. But he's afraid that without it he would be not a very good parent, not a very good citizen. And so he's kind of dependent. So I think it is definitely the case that for people like him and maybe people like me, the drug does something really useful. And for that reason, we're inclined to keep taking it. GRISEL: Well, yes, it's - right, it's compensatory. But then our brain adapts again to make us especially irritable and anxious without it. So when we talked about the possibility of him cutting back, I said, you know, now naturally you're gonna be more anxious and more irritable for, in the case of marijuana, at least probably three or four months while the cells adapt, and you get those sites back. And then you'd be able to say, well, am I really so anxious that I can't overcome it with other more helpful strategies, like exercise or meditation? GROSS: Three to four months feels like a long time when you're going through it. GRISEL: Oh, does it ever? For me, it took nine years till I didn't really miss smoking marijuana. GROSS: That's a very long time. GRISEL: It is a long time. GROSS: Yeah. But you did it. GRISEL: I did it. I did it partly because I also realized that it was not enhancing my life anymore and that I was using it just to cope with not using it. GROSS: You rarely did opioids. They weren't as readily accessible as they are today when you were having problems with drugs. You're right. It's hard to overestimate the power of the hold opiates have come to have on their users. Why are opiates so highly addictive? GRISEL: Yeah, I think, especially now, their effects are so ones that we would value or that we do value. So opiates make a user feel like they are not suffering, that they are completely content, completely comfortable, completely well - that everything is OK the way it is. And I think that for that reason they're so attractive because often we don't experience that things are OK the way they are. So they are kind of a perfect antidote to suffering of any kind. GROSS: But the problem is? GRISEL: The problem is if we reduce suffering, and we produce euphoria using opiates, the brain adapts. And so now we don't feel high and completely content with them. We just feel not sick and miserable. And when we take them away, we feel full of suffering - much more suffering than we had started with to begin with. So the brain produces its own type of suffering. GROSS: So one of the things you object to in the book is the use of methadone to counteract addiction in young people to heroin or any other opiate. What's the problem with methadone, especially for young people? GRISEL: Methadone is a pure substitute addiction. And it - so it takes the place of other opiates. It's easier for society because it's very long-lasting. So people aren't going through this really intense period of withdrawal. They can take it once a day. It's orally active. So that gets around the problem of finding clean needles and not making a mess on the street. They drink a little juice. It's very cheap. It's - so it's easy to administer. It's cheap. And it lasts a long time. And it makes the user not withdraw. So for the rest of us, it's kind of a nice thing because these people who are opiate dependent are kind of out of the way. They're not so hard to deal with. But for those users, especially if they're young, it's even harder to get off of methadone than it is to get off of, say, heroin because it lasts such a long time. It really bathes the brain much longer. The adaptation is really profound. So it was a decent strategy I guess when we had these kind of career addicts. They had been using for 20 or 30 years, and there wasn't much hope of them ever getting off. But I think today Suboxone is a much better choice because it doesn't completely substitute for an opiate. It's kind of a halfway substitute. It helps - it keep away the withdrawal, but it doesn't really produce much of a high. And so that enables people especially if they're motivated to get clean to get through that really difficult period of craving when they can't sleep, and they can't sit still, and they can't bear the suffering - to sort of get through that and then maybe to titrate down. GROSS: So is Suboxone less addictive than methadone? GRISEL: To me, it is because it's less long-lasting, and it's less potent at stimulating the pleasure pathways. GROSS: How common is the use of Suboxone in treating addiction and at recovery centers? GRISEL: I think it's getting more and more common. It's much more expensive, which is part of the issue. So I think it's harder to get, and it's harder to pay for by state and local governments. But I think it is a much better choice. GROSS: Since a lot of people take opioids at a prescription level for pain, and they're also being prescribed other drugs for other problems they're having, what are the interactions to watch out for? GRISEL: Yeah. I think a very problematic interaction involves opiates for pain and benzodiazepines for anxiety or poor sleep. GROSS: Well, what are the benzos? Name some of the drugs. GRISEL: Xanax, Librium - all of the sleep aids are benzodiazepines. GRISEL: Ambien. Yes. Ambien, for sure. And those together with opiates are contributing to a lot of overdoses. So they are - you know, people are both anxious and suffering. So they're taking both these drugs at once, and it's kind of an epidemic. And then they're dying. GROSS: So what's the interaction that happens? GRISEL: Well, they - the way that you die of opiates is by suppressing your breathing. So you actually suffocate to death. That's an opiate overdose. And the benzodiazepines allow you to kind of sleep through that. GRISEL: So it - they enhance your sleep, too. So you're sedated while you're suffocating. GROSS: Let me reintroduce you here. If you're just joining us, my guest is Judith Grisel. She's the author of the new book "Never Enough: The Neuroscience And Experience Of Addiction." And she is a recovering addict and also a neuroscientist who studies the neuroscience of addiction. We'll be right back after a break. This is FRESH AIR. GROSS: This is FRESH AIR. And if you're just joining us, my guest is Judith Grisel, author of the new book "Never Enough: The Neuroscience And Experience Of Addiction." And the book is about her former addictions. She gave up drugs and alcohol 30 years ago and went into the field of neuroscience to study the neuroscience of addiction. She's now a professor of psychology at Bucknell University. When you were using, what was your main drug, and why was that your main drug? GRISEL: My most favorite drug was marijuana partly because it was easy to get. And it really did the trick for me in making life worth living. It made me less anxious and less insecure. It made me feel kind of buffered from the difficulties and the uncomfortable things about living, about social interactions, about my bosses or my roommates or whatever was going on. So I loved it very much. And I smoked as much as I could. A friend at the time said you chain-smoke marijuana, and I think I did. It wasn't as potent then as it is now, of course. GROSS: You're married, and you said you're amazed at your husband's ability to pass up a drink or to have, like, half a beer and leave over the other half because you can't do that. GRISEL: ...Set person - it didn't make sense to me. I was like, how did that get full again? You know, I - it's just the way I'm oriented. I'm really paying attention to it. Sometimes I'll have a bad day. And I'll say, don't you want to drink today? You know, or he'll have a bad day. And I'll say, shouldn't you have a drink? And he looks at me like I'm from another planet. Yeah, you know, and I on the other hand don't understand why it's not a tool for him, but that's the definition. You know, if it's doing something for you - you know, he drinks once in a while to enhance maybe or not. I don't know why he does it, but he's not very good at it. I'll say that. GROSS: So does that lead you to think that there's something called an addictive personality? GRISEL: Sure, yeah. I think the research really bears that out. So about half of the risk is genetic factors. And we don't know exactly what those are for the most part. We have some good clues. But most of the genetic influence is not, so far, explained, and half of it environmental. But we - again, that's so vague and ambiguous and practically infinite. It's hard to know, but I do think that my husband and I respond differently to chemicals. And I think, for me, they're much more likely to be a tool. And for him, they're just something he can take or leave. GROSS: You tell a story that when you got your doctorate, when your thesis presentation was approved, the standard procedure was to take somebody out for a glass of champagne and toast their success. And one of your colleagues looked at you and said, I guess we really can't do that. And, you know, you talk about (laughter) - you're a member of - God, I forget what the organization is called. But it's some kind of organization researching the effects of alcohol. And at their national convention, everybody got a ticket for two free drinks. So do you feel like it's - our society is kind of geared in such a way as to make it really hard for people who are recovering alcoholics to participate in any celebrations? GRISEL: I think it is hard. I think it's less hard for me now than it was in the beginning, but of course I wasn't invited to the - either of those things - a dissertation defense or a national meeting on alcoholism. But I think it's just something to notice how much of society is focused on using - on kind of buffering or escaping or mitigating reality in some way. And for people who can get away with that without self-destructing, I think that's, you know, something still to notice. But for the rest of us - and we're not really that rare. It's a pretty common disorder - addictions. It's about, probably, 12 percent. So 1 out of 8 people - adults - have a problem like me. And for those of us like this, it's kind of alienating because there is this whole very active way of being in the world. What do you do at a restaurant, at work? What do you do - you know, or the work party? What do you do at a football game when it's all around you? It's just - and what do you do now when weed is going to be more and more available? You know, I think it's a little bit surprising to me because I could kind of see if what I had was something very rare that I wouldn't expect maybe everybody to pay attention to me. But because it's so common and so many people have loved ones who are suffering, it seems surprising, I guess, that the using is so pervasive and is such a big part of the way we choose to live. GROSS: So you became a neuroscientist studying the effects of addiction on the brain because you were a recovering addict yourself, and you wanted to understand yourself better and then contribute to the knowledge of addiction and recovery. A lot of people in recovery relapse. Do you think that your growing knowledge as you were in recovery, you know, especially early on - do you think that your growing knowledge about addiction, about the neuroscience of addiction, helped you to stay away from the drugs that you had used? GRISEL: Yes, I do. And I first should say I wasn't all that altruistic in the beginning. I think I wanted to study addiction so I could use better (laughter). GRISEL: Yeah. I think it was a little unconscious. But I figured if it's a disease, and diseases can be cured, then I can cure it, still use. So that was kind of my motivation. But eventually I do think it really helped me because I had something to focus on that was not about how to get and hide my using, you know, get high and then hide it. But I could focus my sort of little bit compulsive energy on graduate school and studying. And I think that was useful. I also really think that understanding how the brain works and kind of the double bind I'm in that - I think I say somewhere that if I - I could use as long as I didn't want to use. But of course, if I want to use, then that's by definition meaning that I'm going to be using it as a tool, you know, in that way. So I do think that I have more compassion for myself. And I recognize that I didn't start out, you know, kind of like a blank slate. I started out with certain tendencies that make drugs for me so valuable and important, that really the courage and the perseverance that I've demonstrated over 30 years trying to both study this and to stay clean and sober is something that I'm proud of. GROSS: Judith Grisel, thank you so much for talking with us. GRISEL: Thank you for having me. It's an honor. GROSS: Judith Grisel is a neuroscientist and author of the new book "Never Enough: The Neuroscience And Experience Of Addiction." She is a professor of psychology at Bucknell University. After we take a short break, Ken Tucker will review new albums by guitarists Steve Gunn and Michael Chapman. This is FRESH AIR. [POST-BROADCAST CORRECTION: In the audio version of this story, Judith Grisel incorrectly refers to Ambien as a benzodiazepine. In fact, Ambien - zolpidem - belongs to a different class of drugs - sedatives or hypnotics.] Transcript provided by NPR, Copyright NPR.